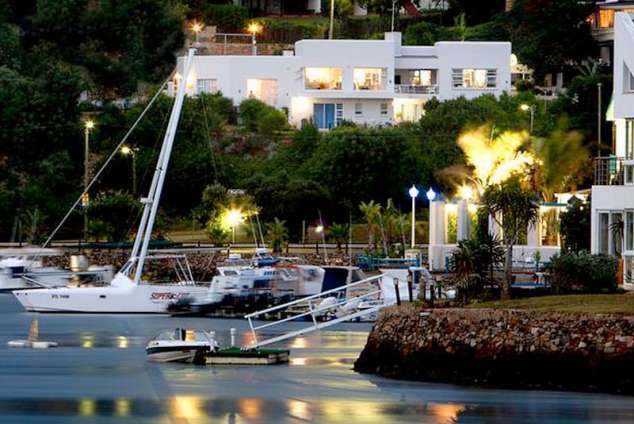 Dockside Guest House - Port Alfred Accommodation. There is a large open planned lounge and dining area - all there for you to take in the spectacular views of Port Alfred. Sit and enjoy a drink whilst watching the sun set after your long day. There is off road parking and a wonderful big garden. Let your hosts, Pat and Des assist you in planning your stay and experience all that Port Alfred has to offer. Port Alfred is known for the wonderful temperate climate, pristine endless beaches, friendly 'village' atmosphere and magnificent Kowie River, which flows out to the warm Indian Ocean. Escape from the hustle and bustle and suspend time. Experience the serenity, tranquility and absolute beauty this little town has to offer. With breath taking views and inescapable beauty, Port Alfred is one of the few places that offer a remarkable range of activities from fishing, sand boarding, surfing, canoeing, horse riding across the beaches, hiking and two well known golf courses. Port Alfred has many beaches; one in particular - Kelly's Beach - has recently been awarded the Blue Flag status. There are endless opportunities for you to enjoy the outdoors, wildlife and magic of this area. Port Alfred is also only 15 minutes from the historical settler's town of Bathurst and within an hour's drive to Grahamstown and numerous private game reserves dotted around the area - all which are malaria-free. Two en-suite bedrooms with fully equipped kitchen, open plan lounge dining room opening onto large patio. The patio has two BBQ areas and leads onto a garden. The apartment overlooks the marina and small boat harbour. The upstairs bedroom has folding doors opening onto a patio. The bathroom has a bath and shower and dressing room. There is a DSTV/TV and wifi in the upstairs bedroom. DSTV in the lounge area and wifi throughout the apartment. It is not suitable for children as there is floating stairs leading to the upstairs bedroom. Fully serviced. All our rooms in Dockside Guest House are elegantly and comfortably furnished to ensure your stay at Dockside is a comfortable and enjoyable one. We want this to be your home away from home and have equipped the rooms with all amenities you will need during your stay. There are five bedrooms - each with different themes and decor. All the rooms have wonderful views overlooking the small boat harbour, the Kowie River and the unique arched Kowie Bridge. You will find a "Welcome Folder" in each of the rooms with information on Port Alfred, activities, events and restaurants in the area. The rooms have heaters for the colder nights and there are also additional luxurious blankets in each of the rooms for snuggling up, relaxing and reading a good book. The Harbour Room is the largest of the rooms and the most luxurious and elegantly furnished. The room has a Queen-sized bed with luxury white linen. The room has two comfortable chairs and a table for relaxing and enjoying the view. There is a full size dressing table, a walk through wardrobe which leads into a large, luxurious bathroom. The bathroom has a large triangular bath, large shower and two basins. The room has a TV with DSTV, a bar fridge, tea and coffee making facilities and hair dryer. The room opens up on to a large balcony with a table and chairs. The balcony overlooks the small boat harbour. The Ethnic Room is furnished with a comfortable double-sized bed and as the name suggests, with décor consisting of Ethnic art and paintings. The room has its own en-suite bathroom with shower, basin and toilet. There are built in wardrobes and a built in dressing table with chair. The room has a TV with DSTV, a bar fridge, tea and coffee making facilities and hair dryer. The private balcony has two chairs and a table and the view is spectacular overlooking the small boat harbour, the Kowie River and the unique arched Kowie Bridge. The Sea Room is a modern furnished room with a double-size bed with luxurious white linen. The room has its own en-suite bathroom with shower, basin and toilet. There are built in wardrobes and a built in dressing table with chair. There is also a luggage holder, TV with DSTV, tea and coffee making facilities, a hair dryer and bar fridge. The room has a wonderful private patio leading out to the beautiful garden with fantastic views of the small boat harbor. The African Room is furnished with comfortable twin-sized beds and as the name suggests, the décor consists of African art and paintings. The room has its own en-suite bathroom with shower, basin and toilet. There are built in wardrobes and a built in dressing table with chair. There is also a comfortable chair, a TV with DSTV, tea and coffee making facilities, a hair dryer and bar fridge. The room has a wonderful private patio leading out to the beautiful garden with fantastic views of the small boat harbour. The Egyptian Room is furnished with a double bed and the décor is Egyptian. The room has a luxury private bathroom with a very large bath, basin and large shower just across the passage. The room has built in wardrobes with chairs. There is a TV with DSTV, tea and coffee making facilities, a hair dryer and bar fridge. The beaches are voted the best in South Africa. There are splendid swimming beaches - including Kelly's Blue Flag beach. Never before have you seen such long stretches of clean unspoilt white beaches with tidal pools and an abundance of shell life. Watch out for the dolphins and the humpback whales whilst taking a walk. Fishing is fantastic in Port Alfred with a range of deep sea, rock, surf and river. There are also deep sea charter trips available and a marina to moor / dock your boat. Don't like the fuss of launching your boat on the beach - then Port Alfred is a great destination as launching the boat in the marina is quick and easy. There is excellent scuba diving in Port Alfred with fantastic year-round diving at Fountain Rocks, a breeding ground for the ragged tooth shark. Port Alfred dive sites are famous for soft coral, the numerous wrecks that dot around our shores and unknown to many, the incredible "Lunar landing" which is where crayfish in their hundreds live and breed. The best season for diving in Port Alfred is during the winter months (late March to late August), with the two best months being June and July. The average visibility (in diveable conditions) is around 6-10m (20-33ft), but it can be up to 20m (66ft) on exceptional days. The water temperature ranges from 12-18°C (54-65°F) but can reach 25°C (77°F) occasionally in January, in which case it is usually very clean as well. Surfing is great in Port Alfred and also a good place for beginners to learn as there are no rocks and beginners don't have to venture too far out as there are sandbanks close to the shore. The point break on the East Beach is one of the best surfing spots in South Africa. There are also many other water sports such as swimming, snorkeling, canoeing, waterskiing, pedalos for hire, boats for hire, jet-skiing and river cruises. For a magical river cruise along the Kowie River in Port Alfred, we recommend Let's Go Cruises as they cruise along the river and around the little canals in the marina - this is an unforgettable experience and one not to be missed. This boat rides out 4-5km and back again with the trip lasting around 1.45 hours. The river boat seats up to 40 passengers and has a toilet on board. Golf - The Royal Port Alfred which is one of only four Royals in the country and is an experience not to be missed. This is one of the true links courses in South Africa and is set on rolling hills with indigenous bush, game and sea views. The course is 5 800 meters and has a unique layout. There is also the Fish River Golf Course designed by Gary Player. This is an 18-hole course stretching out along the Indian Ocean coastline. Bathurst is a 10 minute drive from Port Alfred. The main road is lined with fascinating shops, art galleries and open artist's studios, coffee shops, restaurants and pubs. There are many places of historic interest including Brandshaw's Mill, the panoramic viewpoint of The Toposcope and many settler buildings and churches of architectural and historic significance. Other places of interest are the Big Pineapple and the Bathurst Agricultural Museum. The Horse Shoe Bend and Water's Meeting Nature Reserve are a must for environment enthusiasts. There are various Horse Riding options available in and around Port Alfred. You can choose to ride a horse through game reserves or along the beautiful pristine coastline and onto the beaches. There are many, many hiking trails in and around Port Alfred and you will find something for everyone. You can hike through nature reserves, along the wild, unspoilt beaches and see an array of wildlife and birds. There are many game and nature reserves around Port Alfred and you will find something to suit all budgets. You can choose from doing a self-drive safari to tour operated ones. You can also explore some of the game reserves by quad bike or horseback. Addo Elephant Park is a must. Many people throughout the world consider East Africa to be the ultimate African experience, yet annually the Addo Elephant National Park attracts more visitors that the Serengeti National Park. Elephant viewing at Addo is rated as the best in the world. Visitors have the option of self-drive excursions into the park or they can make use of professional services offered by the Park. Well-trained guides accompany guests on open game-drive vehicles for day and night drives. The dense thicket is ideal elephant country and can support four times the density of elephants that the Kruger National Park. If hunting is your thing, then the Eastern Cape is the leading game hunting province by far and is a sought-after destination for hunters from all over the world. There are endless opportunities for you to enjoy the outdoors. Let your hosts, Pat and Des assist you in planning your stay and experiencing all that Port Alfred has to offer. 408 page views since 30 Jul, 2018.